Bea passed away peacefully at the age of 101. Born in Pittsburgh, PA, she worked as an executive secretary until she enlisted in the Navy at the beginning of WWII, becoming one of the first WAVES. After the war she settled in San Francisco and, after a 3 week romance — two of which were by mail as her future husband was decommissioning a ship in Pearl Harbor — married Herbert Jones, discovering only at the wedding ceremony that he was only 21, six years her junior. She returned to Pittsburgh where she continued working full-time, even after the births of her 3 children, retiring on her 65th birthday. She moved to Edgewater, Florida when she was 85, surprised to find out that the Steelers weren’t on every Sunday, prompting years of game day visits to Merk’s and McKenna’s. She is survived by her daughters, Kahren Arbitman and Renice Jones, son, Richard Quinn, grandchildren Beth Hellerstedt, Carl Hellerstedt, Caitie Quinn, Seamus Quinn, and Laura Kopopoulos and great-grandchildren, Andrew and Daniel Kosc and predeceased by husbands Herbert Jones and Harry Quinn, son Michael Jones, and brother Richard Stein. 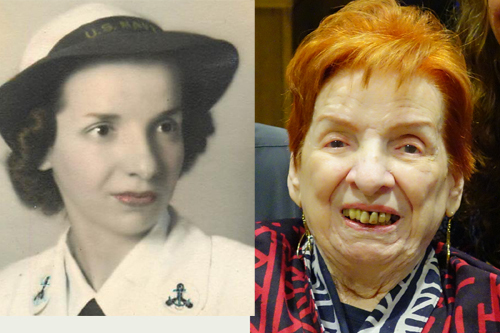 To honor Bea’s life and Navy service, donations in her name can be made to the Navy-Marine Corps Relief Society (www.nmcrs.org) or your favorite veteran charity. A wonderful person with a laugh and smile for all. I only knew her forty plus years ago for a short time but enjoyed her friendship. A loss for Renice and her sister and grandchildren for sure but happy they had her until now. May Bea Rest in Peace and we enjoy her memory.